A large municipal cemetery opened for new burials in 1861 and still in use. There used to be a fine chapel either side of the stone arcade shown in the picture, both now demolished. The cemetery contains the graves of miners killed in the Oaks Colliery explosion of 1866. There are also many fine monuments marking the graves of prominent local industrialists, particularly from the linen and glass-making industries. 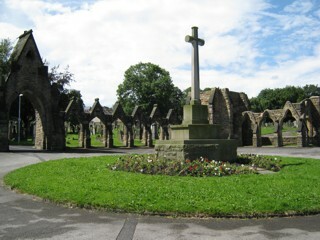 There are also a large number of Commonwealth War Grave Commission gravestones indicating the significant role the people of Barnsley played in both wars. About 50% of the gravestones have been photographed and indexed, mostly from the 1860s to the 1920s. The GPR holds 569 grave and 1736 person records for the cemetery. The status of the photographing of the cemetery is 50% complete. There have been 239 requests for photographs from the cemetery.